Starbucks Doubleshot is promoted in a 60 second TV commercial featuring veteran rockers Survivor and an ambitious office worker, Glen. Glen is followed throughout his day by Survivor as they sing a spoof of their lyrics for “Eye of the Tiger”. From shaving in the bathroom to arriving at the office, they have something to say about his driven lifestyle, powered by Starbucks Doubleshot. The strange thing is the two online versions have slightly endings. In the College Humour/Bikini Edit version Roy is waiting at the lift on the left side. In the Starbucks version Survivor start singing “Roy” to Roy as he walks from right to left. Hank’s supporters follow him around with a giant mascot representation of him, chanting with the song Rock & Roll: Part II by Gary Glitter. Glen, Roy and Hank were created at Fallon, New York, by creative director Ari Merkin, art director Rob Baird and copywriter Allon Tatarka. 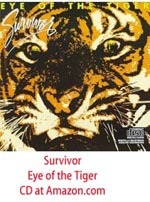 Survivor gave us “Eye of the Tiger” on their album of the same name back in 1982, also featuring as the theme tune of Rocky III. And the product? It’s a can of Starbucks espresso “mellowed with just a touch of cream”. Starbucks have a dedicated micro site for Doubleshot, featuring another office worker, Hank. 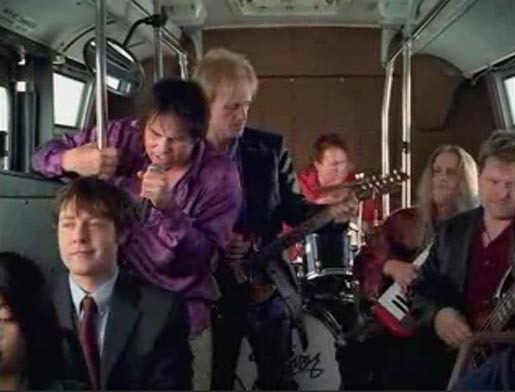 The ‘Hank’ ad, “Bleachers”, was directed by Tom Kuntz via MJZ.